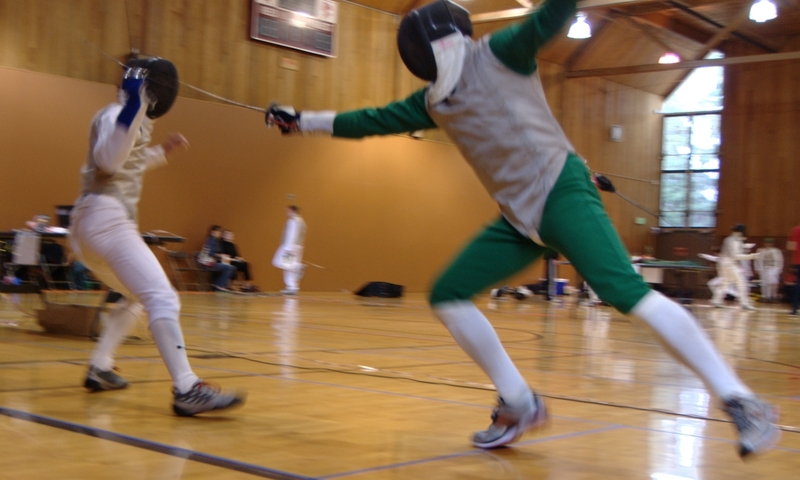 I signed up last week to compete in a fencing tournament on May 1st. Since then I’ve been contemplating how to approach the tournament. I haven’t done any fencing competitions for 2+ years. I’ve gained a lot of sophistication and knowledge in regards to physical training and nutrition in those last 2 years, so I figured I would try to use that knowledge to help improve my game at the tournament. I’m going to need all the help I can get. A week isn’t really enough time to have much of an effect on my physical conditioning. It is, however, a great amount of time to heal up. I’ve been going pretty hard the last few weeks and have some sore spots: my wrist hurts, my right index finger hurts, my foot has some hot-spots on it, my ankle is sore, and my back is sore. Nothing too extreme, but all things which could affect my ability to perform at the tournament. I fenced for a few hours today, but that was probably the last real strenuous activity I’ll do before the tournament. I plan on doing some mobilization and stretching Monday, Wednesday, and Friday this week in replacement of my usual lifting schedule and going to fencing class on Thursday to run some drills and fence a few bouts, but not to fatigue myself too heavily. I’ll also be keeping up with my usual frequent icing of my back throughout the week. The day before the tournament I’ll probably run some blade-work drills at home and just get in the mood for fencing. Hopefully if I can lock all that down, I’ll be in pretty top shape physically for the tournament on Sunday. The nutrition side of this is a bit more of an experiment for me. Last time I fenced a tournament, I had a completely different dietary approach (high-carb, low-fat then vs. paleo now). Thinking about the demands of fencing, I think I have a pretty good idea of what I need to eat. Either way, I’m going to try it and modify next time as needed. A fencing tournament consists of a round-robin style pool (usually 6-8 fencers depending on the number of fencers present). I will get to fence each of these competitors to 5 points or time runs out after 3 minutes. Between each bout I’ll have a few minutes to recover. After this, the fencers are ranked and placed into a direct elimination ladder. These matches are to 15 points and have longer time limits, with a break in the middle (I can’t remember the exact times for this are, somewhere in the 3-5 minute range followed by a 1 minute break, followed by another period of fencing). These periods of fencing require elevated aerobic activity over the entire period of the bout, which short bursts of high intensity, phosphagen and glycolytic pathway work. Because I typically eat a fairly low-carb, high-fat diet, I’m confident that I can sustain the aerobic portion of my fencing bouts and energy levels throughout the day by converting dietary and body fat into energy. I’ve been playing around the last few weeks with eating more carbs to see what happens, but in order to be certain that I can utilize fat sources effectively on Sunday, I’m going to go back to low-carb eating for the remainder of my time before the tournament. I’ll still be eating some carbs, just not pushing them like I had been the past few weeks. Breakfast on tournament day will be bacon and eggs (like usual), and I’ll bring some pemmican if I need some additional fat during the day (pemmican, in case you don’t know is basically beef-fat and jerky melded together). The wild card then is the need for bursts of power. I’m going to need glucose to fuel those actions. I should have a reasonable amount of muscular and liver glycogen stores built up via the carbs I’ve eaten plus gluconeogenesis, but they’ll get depleted as things progress. Consuming glucose seems to be the way to go (as opposed to fructose — sucrose appears to be about the same as glucose) to restore muscular glycogen stores (see this study). Glucose also replenishes glycogen much quicker in the first hour following exercise which means I will be consuming it throughout the day between bouts, probably a banana and some berries as they have decent glucose to fructose ratios. I’ll have to go easy on the banana though so I don’t spike my blood-sugar. I’m pretty sugar sensitive since I don’t eat much normally. Water will also be incredibly important. Wearing 3 layers of clothing and a mask tends to make one sweat a lot. To counteract the fluid and mineral loss, I’ll be prepping this week by taking a calcium/magnesium supplement and putting extra salt on my food. I’ll also probably bring along some coconut water to get some electrolytes as the day goes on. Electrolytes are critical to keep muscles and nerves functioning properly, so the last thing I need is to become deficient and lose precision or accuracy. This is certainly all just guesses, but it should give me a good baseline to start off of and improve as I attend more tournaments.